First-time visitors to the Philippines should expect a good-natured hazing from their local contacts, one that comes in a culinary dare. No trip to the Philippines would be complete (they'll say) without eating balut! What is balut? What makes it so special? And why is this Filipino food constantly being pushed in the faces of foreign visitors by well-meaning Filipino locals? Balut is very simple: it's a fertilized duck egg, the embryo permitted to develop in the shell from 16 to 25 days, then boiled in the shell. (For your reference, duck eggs typically hatch at 27 to 30 days.) Crack a shell of balut open, and you'll find a partially-formed duck embryo soaking in a pocket of chicken-soup-like broth and surrounded by the usual components of a hard-boiled egg. The presence of the embryo defines balut (a boiled duck egg without an embryo is penoy, a different thing altogether). For the subtlest, most tourist-friendly balut, ask for balut sa puti (“balut in white”), so called because the balut is covered in a sheath of eggwhite. Balut is sold on the street by roving mambabalut (balut sellers). The stuff is dispensed from cloth-covered baskets that keep the balut eggs warm; you'll be given rock salt to sprinkle onto the egg once you've cracked it open. You can try asking for a younger, less-developed balut, but realistically, you can only take what the mambabalut has to offer... and that is hit or miss! The older the balut, the fuller the embryo's development, much to the detriment of the first-time eater's appetite. Beyond 22 days old, balut reveals a partially-formed embryo that looks ragged and sad, a sorry almost-featherless imitation of a duckling stuck onto a yolk. Eat it and expect to encounter embryonic guts, cartilage, maybe the odd feather as you chew. You'll be expected to eat the duckling first, the rest of the egg afterward. Balut is more popular in some quarters than others. “Filipino men think that balut is an aphrodisiac,” Chris Tan explains. “I'm not sure if it is really true—might be a case of mind over matter!" More often, balut is eaten while drinking beer with friends. 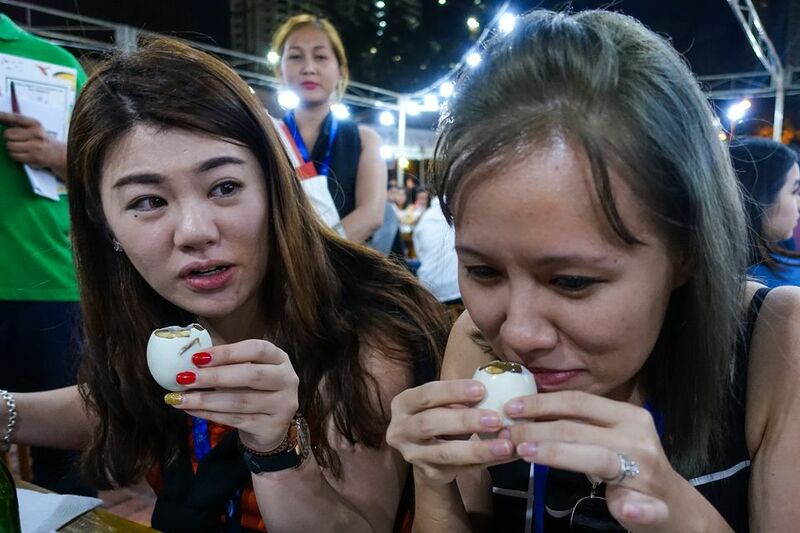 Other Filipinos would rather just eat balut's embryo-less counterpart penoy, which is sometimes coated with orange-colored batter and fried to make the artery-clogging street food called tokneneng. There's no good reason not to—it's not known to cause any allergic reactions, and you're not expected to eat it in large quantities. For the purposes of tourist hazing, eating one will do. If you don't like it, let's hope you at least have some amusing pictures of the experience to share on Facebook. If you do like it... well, have as many as you like, you're in the Philippines, after all. Eating balut is nothing like eating a hard-boiled egg, but the process is deceptively easy to pull off. Look for the right egg. You want an egg with a thick shell and no visible cracks. Once you've found the right egg, crack a small hole at the fatter, rounder end of the egg. Don't eat immediately; you'll want to sprinkle salt into the hole and drink the small mouthful of egg broth that floats to the top of your balut egg. There's less than a shot-glassful of broth, and it's consumed as you would a shot of booze. Peel the rest of the shell; eat the yolk and egg white as you go along. If you have a bowl of vinegar handy, take little bits of the edible parts and dip it in the vinegar before consuming. Eat the embryo last. If you've got an appetite for it at all.